What's Happening with The Meg 2? The Meg 2 is currently looking for the right script to move forward. Last year's The Meg was an unexpected hit when it was released towards the end of the summer. The Jason Statham-starring action project was able to earn over $530 million worldwide and was applauded for its tongue-in-cheek humor and over-the-top special effects. In the end, it was a perfect storm for The Meg, which may or may not be able to be repeated for a sequel. The Meg producer Lorenzo di Bonaventura was recently asked about the sequel while attending SXSW in Austin, Texas. 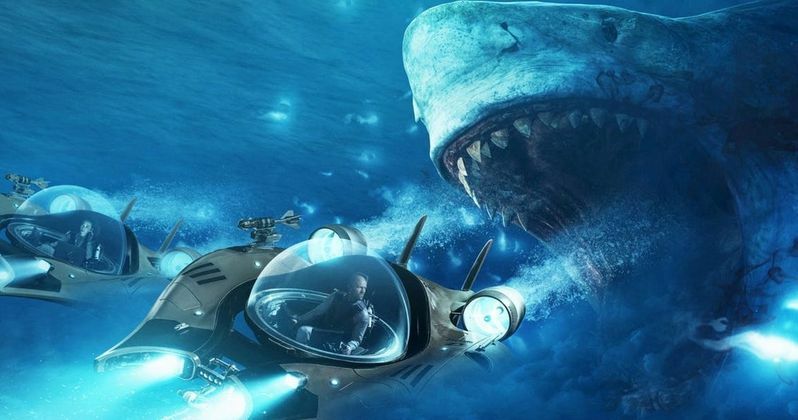 News of The Meg 2 popped up late last year when executive producer Catherine Xujun Ying confirmed that it was in development, but noted that it was a "secret." While it might not truly be a secret, it is still in the very early stages of development. Bonaventura had this to say about the sequel. "We're working on a script. Yeah. So you never know until you get a good script... I was very thankful that the audience got that we were just trying to have fun, (and) not take ourselves seriously at all." The Meg was a co-collaboration between U.S. and Chinese studios, which proved to be a great success and paved the way for a second installment. Source material writer Steve Alten has hinted that there are plenty of other underwater threats to be found in the franchise, so that won't be too hard to pin down. Jason Statham has even said that he would be open to returning for The Meg 2. With that being said, it is still unclear which direction the studio and writers will want to take the franchise. Regardless, it still sounds like a lot of fun even without knowing any details. Before The Meg hit theaters, it wasn't exactly clear what the movie was going to be. The first bit of promotional material seemed to paint it in a very serious light, though it was still pretty absurd. However, as time went on and the giant prehistoric shark was revealed, the movie's true colors were promoted and it went from a Jaws-type movie to a straight up fun popcorn movie that was perfect for the end of summer as everyone prepares to get back into the normal swing of things. Related: The Meg 2 Is Pulling Ideas from Steven Alten's Other Meg Books? While it is unclear of The Meg 2 will officially happen at this point in time, it is good to know that it is still in development. Who knows, Lorenzo di Bonaventura could be throwing out some misdirection since Catherine Xujun Ying noted that they wanted to keep it a secret. Whatever the case may be, fans are excited at the idea of a sequel that brings us more over-the-top action and comedy with crazy special effects. The Meg 2 update was first reported by CinemaBlend.